Are you a senior or do you know a senior? Did you know seniors may qualify for extra money each month to spend on food? 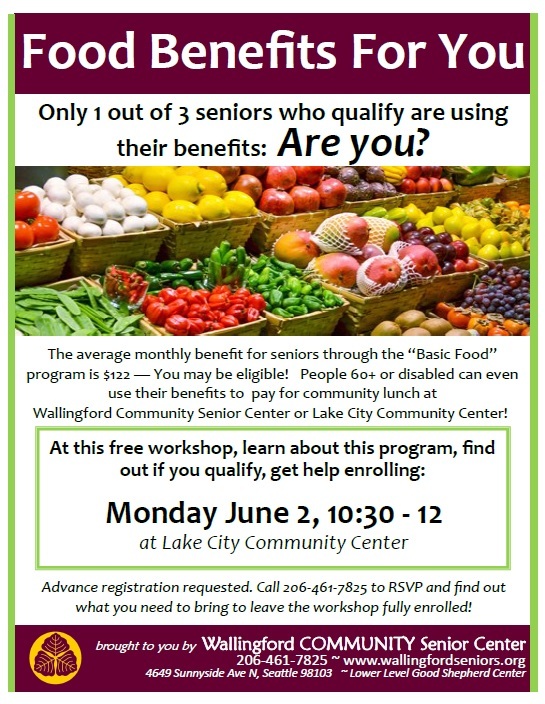 Our friends at Wallingford Community Senior Center are presenting a special workshop for seniors on Food Benefits this coming Monday, June 2nd. The workshop will take place at the Lake City Community Center (12531 28th Ave NE, Seattle, WA 98125) 10:30 am – 12 pm and will be followed by HIP’s weekly Senior Lunch. Quiche, roasted butternut squash and berry crumble are on the menu!